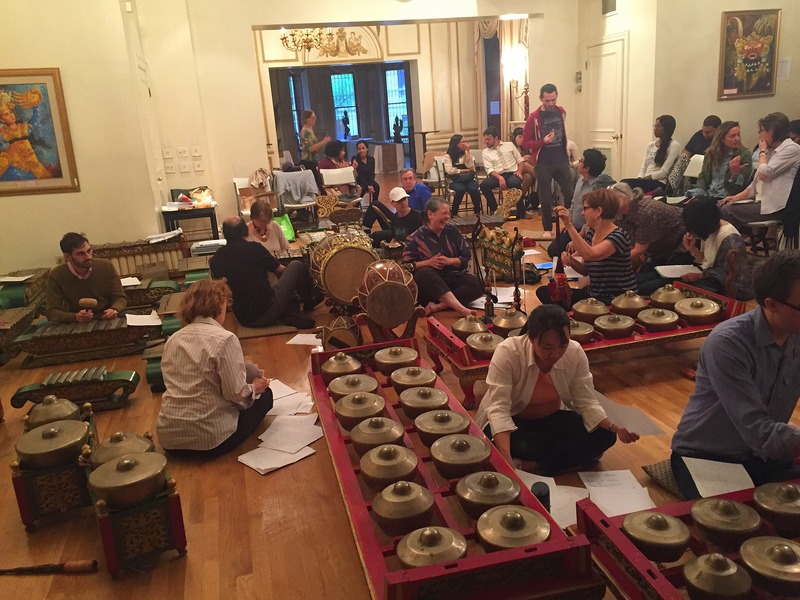 Gamelan Kusuma Laras, the Javanese music ensemble I’ve been playing with for several years, will give a concert Saturday night at Roulette, the prestigious new-music venue in Brooklyn. Javanese gamelan is stately, meditative, polyphonic, sometimes shockingly rowdy, quite exotic and not for every taste. You can check out samples online but you can never really get a true sense of gamelan music except by experiencing it live. This concert officially begins at 8 pm but we will start playing at 7:45 with a couple of pieces traditionally used to welcome the audience. Then we’ll play three long-ish pieces, one of them composed by our music director, the phenomenal I. M. Harjito. And the show ends with a dance piece featuring guest performers Anang Totok Dwiantoro and Triwi Harjito in full costume and makeup. Check it out and let me know what you think. You may or may not know that I’ve been playing gamelan for several years now. 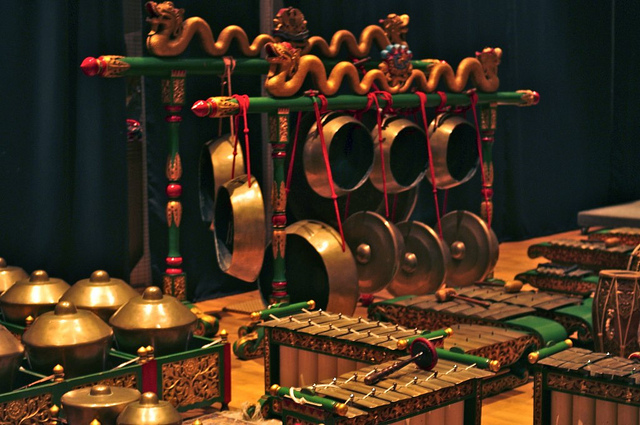 You may or may not know what gamelan music is…. Gamelan is an Indonesian percussion ensemble that comes in two varieties, Balinese and Javanese. Our group, Gamelan Kusuma Laras, is Javanese and specializes in music specifically from Solo, one of the cities in Central Java. 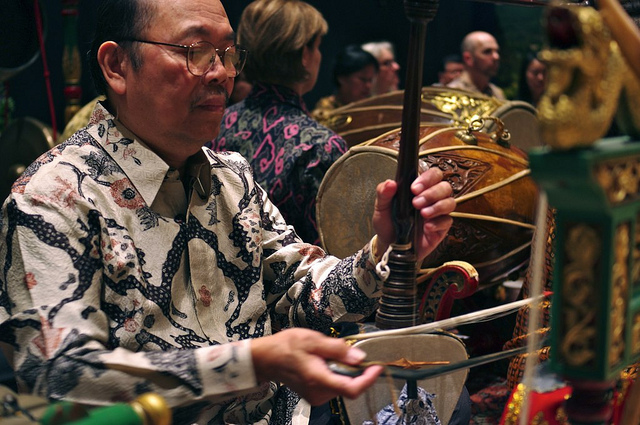 Javanese gamelan music is rich, dense, polyphonic, precise, meditative, quite exotic. There’s also a fair amount of singing, for solo voice and choruses, but the singing is part of the orchestral blend, not front and center the way it is in a lot of Western vocal music. Hearing recordings of gamelan music, it’s almost impossible to imagine how it is produced. Seeing the various instruments and how they’re played is a treat in itself. Gamelan is definitely not for everyone. But if you’re curious about music from other cultures or know a little bit about gamelan, this would be a great opportunity to experience the music live. program includes a bunch of unusually intricate and cool pieces, and I’m delighted that I’ll be playing on all the pieces we’re playing. One of the guest vocalists will be the extraordinary Jessika Kenney, and we will also be joined by a terrific dancer performing in full makeup and costume. 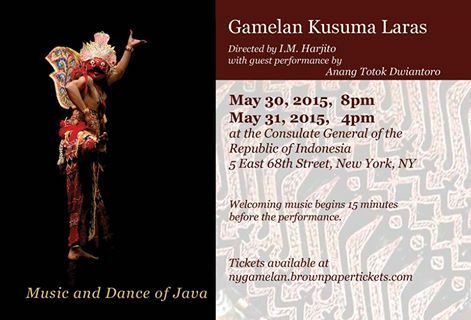 The concert takes place at the Indonesian Consulate, a beautiful old New York mansion at 5 E. 68th Street. At intermission, very delicious Javanese snacks will be served free of charge. And the tickets are only $20. (You can buy them online here.) Check it out and let me know what you think. This Saturday, June 21, more than 726 cities around the world will celebrate the longest day of the year with a global celebration of music making. In New York City, there will be over 1,300 concerts on streets, sidewalks, and parks across the five boroughs, all free and outdoors. As part of Make Music New York, Gamelan Kusuma Laras, the Javanese music ensemble that I play with, will be throwing a block party on East 68th Street between Fifth and Madison Avenues, in front of our home base, the Indonesian Consulate. We’ll be playing from 12 noon until 6 pm. Feel free to drop by for a few minutes or stay all afternoon!